It should be self-evident that a country name is not the same as a nationality, does not equate to a language and so on. That said, a surprising number of websites confuse particularly countries and nationalities. Often, a question asking for nationality is accompanied by a listing of countries. On packaging, country names and flags are often used to indicate language, and this can backfire. 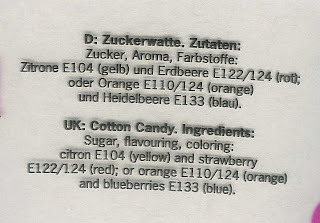 On a package of candyfloss (British name) the information and ingredients listed under the heading UK: referred to the product as Cotton Candy (US and Canadian name) and used American spellings such as coloring instead of the British colouring.